The following examples are translations from the Purgatory River area which are based upon sketches that were drawn from slides and photographs of Bill McGlone, who hosted Viewzone's visit to the site in 1998. Bill had an extensive collection of photographs that he took of each panel of petroglyphs at different times of the day. He always attempted to photograph the canyon walls when the sun was at just the right angle to illuminate the faint depressions and his expertise in knowing the optimal time for each particular location allowed many of the most ancient petroglyphs to be seen when they would otherwise never have been noticed. Although we do not have the photographs to accompany these translations, Viewzone did, in fact, witness a majority of the collection being presented in this feature. Many of the translations reveal a rich spiritual life, devoted to the deity "Yah." But many of the other petroglyphs appear to have been used as signs for the inhabitants and visitors to the area. The panel on the right is an example of what might be considered a sign or posted notice. This particular group of symbols shows that the symbols could be read from bottom to top (as with the ligature) and includes a ideogram (a circle) commonly used to represent the full moon. Dr. Harris has added the "Alef" to the translation that does not appear in the actual script. This unique symbol is silent and is therefore frequently not written in the Colorado variant of Old Negev. The translation of this panel would thus read, "Be fearful (reverent) in the mountain at full moon." 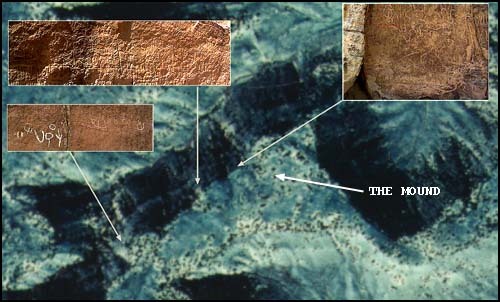 Additional examples of utilitarian signs and posted warnings suggest that the general population of this area was able to read and understand these messages. We can infer from this that their spoken language would be a form of old Hebrew. Another non-religious example is given below. Ironically, the water running throughout the Purgatory River (and the surrounding La Junta region) is rich in magnesium. Local residents have gotten used to drinking bottled spring water. Drinking the tap water or accidentally ingesting the river water causes almost instant diarrhea (milk of magnesium). This particular group of symbols was located near a point of easy access to the river bank and obviously served a useful purpose. Again, the use of these signs suggests that local inhabitants were able to read and benefit from the warnings contained therein. kh-l-d = hide, abide, continue for the duration of life; h-k = to be smitten, beaten down; h-t-r = to flow, (water) run, (or light) to shine bright. Translation: Hide or be smitten when the sun is bright [as at high noon indicated by the sign on the far left]. This interesting arrangement (above) can be read from both directions, has an unusual chiasmus arrangement and seems to be poetic in both form and structure. Reading from right to left we have d-' = to know, to be aware of (from y-d-'); n-h-l = to provide (sustain life); n-d = a heap or mound. Reading from left to right we have d-n = judge; l-h-n = but (with qualification); '-d = (defec. for '-w-d) = to testify again and again. Translated: Know how to maintain the mound (hill of judgment), judge but testify again and again. There are many references to a hill or mound in these translations. Dr. Harris, who has not been to the site, could not have known that the canyon contains a ramp-like mound of earth that rises up some fifty feet to the canyon wall. At the top of this "ramp" there is an unusually large amount of symbols and layer upon layer of ligatures. The surface of the rock face at the summit of this mound has literally been worn flat by repeated inscriptions in the stone. This mound can easily be seen in a satellite photograph (taken in infrared) of the canyon [below].